Welcome to The Incarnate Process episode 12 – Kynazarr Rough part 2. 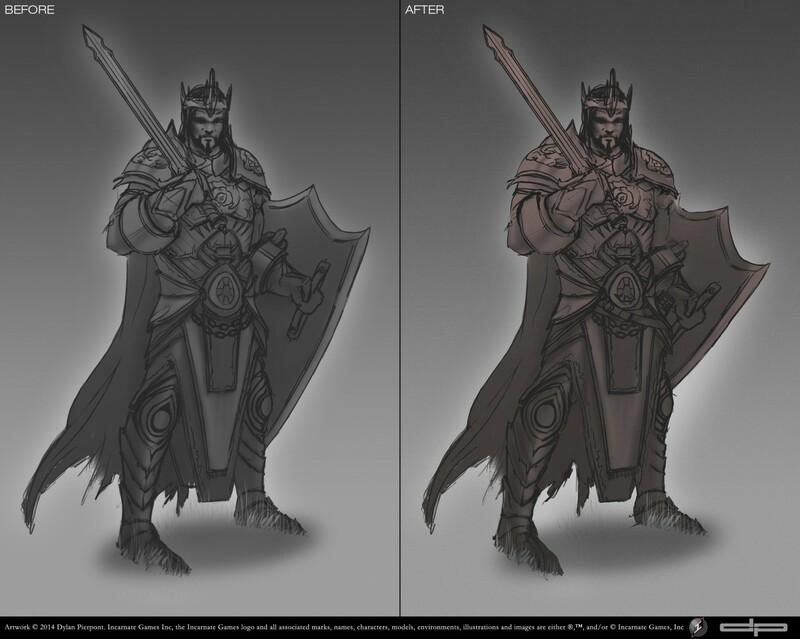 Jason requested that the arms for Kynazarr be bulked up to stand against the brawn of King Eloden. There were a few other minor additions and alterations as well. Alright! Beefed up his shoulders, widened his stance and bit, added a sheath, and turned his right leg (our left) towards us a bit. Yeah dude this is it, he looks a lot better. Compared to the before image, this new Kynazarr is much beefier. This is awesome! I also noticed you lowered his shield a little bit as well, this may be due to having widened his stance. I like being able to see the kneecap of the leg armor better now as well. Very cool man. Perfect. Yep. I lowered the shield so it felt more natural and less stiff as though he was trying to hold it up unnecessarily. Which as you noticed does give a bit more room to show off the knee joint. Both that and the leg armor are going to be fun to work out. I intend to beef up the knee joint just a tad and embellish the grieves to match the rose/thorn motif we agreed upon. Episode #13-18 will be temporarily hidden until we announce the title of the game. Stay tuned for EPISODE # 019: Revenant Concepts 3 which will be posted soon!